I love this idea for breakfast. I am definitely going to try this. I agree, I am not vegan but we are eager to eat more vegetables and whole grains and beans, and find ways to resist processed foods, especially on those days we feel overwhelmed. And like many of you, I have been enjoying my Instant Pot , and always on the lookout for new tasty ways to use it. Quinoa is new to me, and I have some waiting to be cooked. Eating it warm for breakfast appeals to me. Can’t wait to try it. Just got my Instant Pot this week. Didn’t even think about using it for breakfast! Will be trying this recipe out. Thanks. I recently bought an Instant Pot and I have been looking for recipes to try. Quinoa for breakfast sounds delicious! I used a pressure cooker in the 70’s on the stovetop. Recently I purchased an Instant Pot and I am having so much fun creating meals with it. 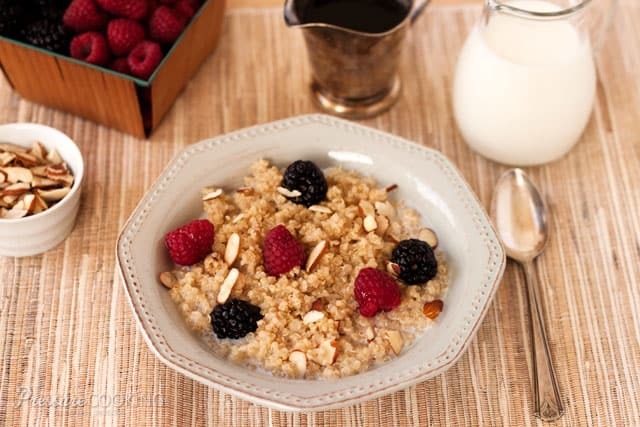 I’ve enjoyed quinoa in main dishes so I know I will love using it in a breakfast meal. I especially like the 1 minute cooking time! Great recipes! Looking forward to trying more of your suggestions! This is great. I bought some quinoa ages ago but haven’t gotten around to making it. Thanks – I just went back to the original email and it crashed Outlook again. For the record, I’m not having this issue with any other emails. I’m not complaining here, just wondered if anyone else was having this issue. When I click on the email to open it I get “Outlook Not Responding” and then messages that it is contacting the website and another Amazon site. This went on for several minutes until I gave up and closed Outlook. No worries as I can access everything on the website but it’s a weird glitch. Thank for all of your great recipes and advice 😉 I bought an Instant Pot in November and have been talking about how great it is so much that five friends and colleagues have also purchased them and now we’re sharing recipes. Great fun! This recipe sounds delicious. A nice change from oatmeal. 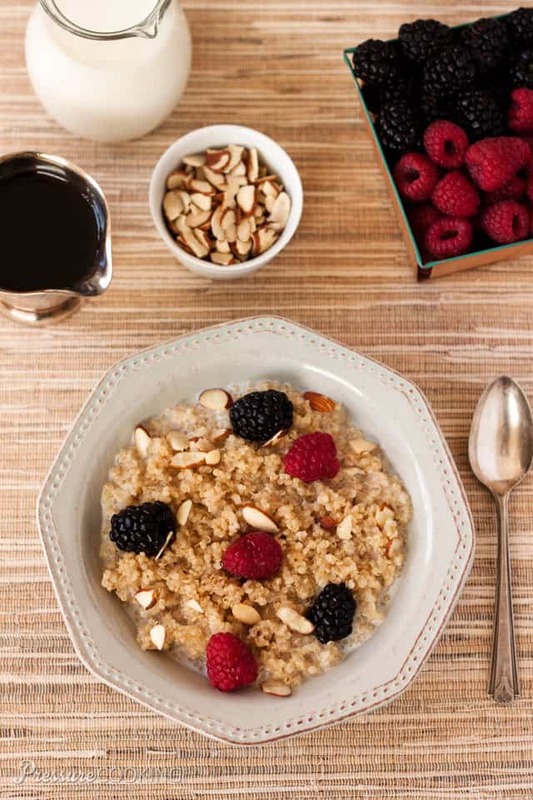 We love quinoa but never have tried it for breakfast. 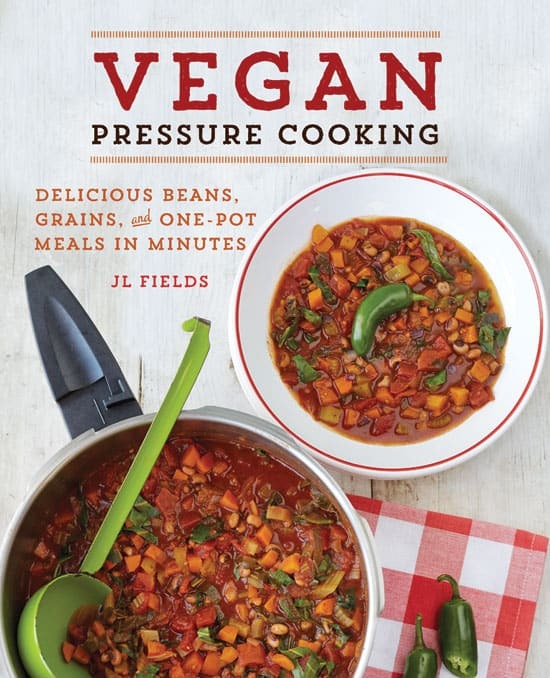 Would love to be the winner of this Vegan Pressure Cooker cookbook! Thanks! Using the pressure cooker more each month. Grains would be a great way to go. I am looking forward to improve my family’s diet to include more grains, beans and.vegetables and I know I need some recipes with a lot of flavor to make this happen. it has to be interesting to get them to try something new. I have made quinoa in the pressure cooker (got on for Christmas) and it turned out great! Looking forward to trying this one! We have a vegan in our family circle now, so am glad to see a new cookbook out as my son now has a pressure cooker too! I am interested to try Quinoa for breakfast. I am always looking for ways to increase beans and grains in our diet. Thank you for the giveaway! I could really benefit from this great cookbook. I’m new to pressure cooking and haven’t ventured past meat dishes. I am so excited to try this! Quinoa is truly a super-food! I’ve made quinoa for breakfast a few times but never in the pressure cooker. LOVE the idea of adding maple and cinnamon while it cooks. Can’t wait to try this one. This is great, I was going to make pressure cooker oatmeal for breakfast but this recipe is a much better plan. More protein and I like the nuttiness of quinoa. Like you, I’m not a vegan, but I do eat vegan and vegetarian dishes quite often. I love quinoa and enjoyed this recipe. Thanks for the opportunity to win the book!